Our sandwiches are made fresh using only the best quality ingredients. Using Local Bread which arrives every morning straight from the bakers– you can expect a truly delicious sandwich. Choose from white, wholemeal, granary, rye bread and rolls. Queue buster! If you’re in a rush and want your sandwich quickly then why not call us with your order? 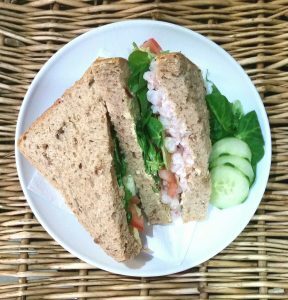 Let us know what you would like before 11am and your sandwich will be waiting for you – call: 01473 824665. Choose your own fillings from the deli counter. We also have quality soft drinks, crisps, homemade cakes and snacks available. Alternatively why not try a homemade sausage roll, pie or quiche. Vacherin Mont D’or, the famous seasonal cheese is now available to buy. Please see our Christmas opening hours here. Authentic Italian Panettone is now available in two sizes, 250g and 500g. Panettone, pronounced Panet-to-ne, is a type of sweet bread loaf, originally from Milan, it’s traditionally enjoyed during Christmas and the New Year festivities. Copyright © 2019 Ferguson's Delicatessen. Powered by WordPress. Theme: Accelerate by ThemeGrill.